Experienced divers know a little secret about Michigan: it has a corner on the world’s scuba diving market. Instead of heading to the Caribbean or the wreck-rich waters off the Carolinas, thousands of divers choose to jump with both flippers into Michigan’s Great Lakes waters. Doug Bell, owner of Traverse City’s Scuba North, said Michigan ranks among the top 10 states in the number of certified divers and is considered world class for wrecks. 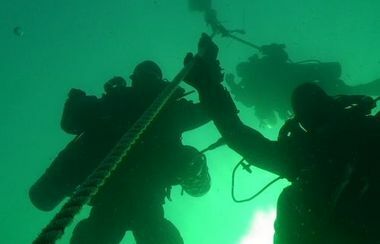 "In my opinion, and I’ve been fortunate enough to travel to quite a bit to a lot of locations to dive, the Great Lakes offer the best shipwreck diving in the world," Bell said. Four of the five lakes touch state boundaries and had ship traffic for nearly 400 years. That’s 400 years of wrecks available. Many are perfectly preserved having sunk in fresh and relatively cold water. "A lot of people in the diving community are scared off by the Great Lakes," Bell said. "They go to Florida or North Carolina and think our lakes are too cold. That’s a real fallacy. Once you have the proper training and equipment, the cold really isn’t the deterrent people imagine. "We have wrecks you can dive dating to the mid-1700s up to the 1960s, from schooners, to Great Lakes ore carriers and everything in between." Many of those wrecks are found in one of the Michigan’s 13 underwater preserves. The preserve system is administered by the Michigan Department of Environmental Quality. It was created in 1980 by legislation drafted by sport divers to provide diving opportunities and protect sunken ships from being ravaged by artifact hunters. Other wrecks lay strewn across shoals and deep lands of the lakes, many with artifacts still intact.